Take an intimate look into the contemporary world of absinthe. 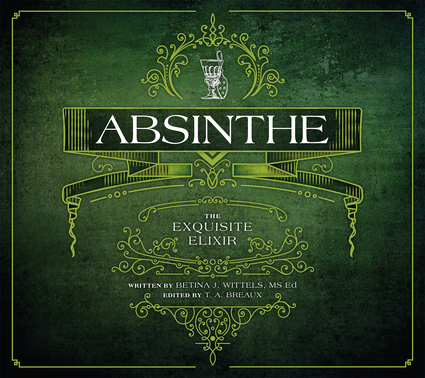 International in scope, Absinthe: The Exquisite Elixir is a visually rich journey into an alluring subculture. Filled with color reproductions of classic and current lithographs, posters, cartoons, as well as photos of antiques, glassware, and other tools of the absinthe drinker, this new and comprehensive guide explains and illustrates the history, culture, and mystique of the drink known as the Green Fairy. The authors provide insights into the controversy and effects of the Green Fairy through the stories of famous connoisseurs, including Vincent van Gogh, Oscar Wilde, Ernest Hemingway, and Pablo Picasso. In addition to a rich history, this detailed new guide includes recipes, reviews of existing Absinthe brands, and absinthe's contemporary culture and ritual. Confirmed absinthe drinkers, neophytes, the curious, and collectors will all find this book equally intriguing and seductive. Betina J. Wittels, creator of the website www.allthingsabsinthe.com, was one of the first people to formally introduce absinthe antiques into the United States more than twenty years ago. Passionate for life, she is willing to turn over any boulder or slip into any barrio to uncover a rare spoon or a bottle of vintage absinthe. T.A. Breaux is a native New Orleanian and research scientist who has dedicated more than twenty years of research toward resolving the mysteries and myths associated with absinthe. His work led to the founding of Jade Liqueurs (www.jadeliqueurs.com), and he helped lead the effort to lift the nearly 100-year ban of absinthe both in the United States and France. Since 2000, his work has been lauded throughout the press and media in the U.S., Europe, and Australia in numerous television appearances on The History Channel, Discovery Channel, CBS, MSNBC, Travel Channel, and PBS.